Steve Bohlert (Subal Das Goswami) lived in India as an itinerant Hindu monk and later served as a Christian pastor in the Midwest. His intimate knowledge of traditional Radha-Krishna devotional practices and Christian spirituality inspires seekers to forgo dogmas, embrace life, and progress on the path to full, intimate God-dess realization. He presents a rare, inspiring insight from a universalist worldview that is intellectually charming, philosophically invigorating, and spiritually joyful. It increases practitioners’ enjoyment in this life and in the next too. Steve Bohlert’s biography and more info. 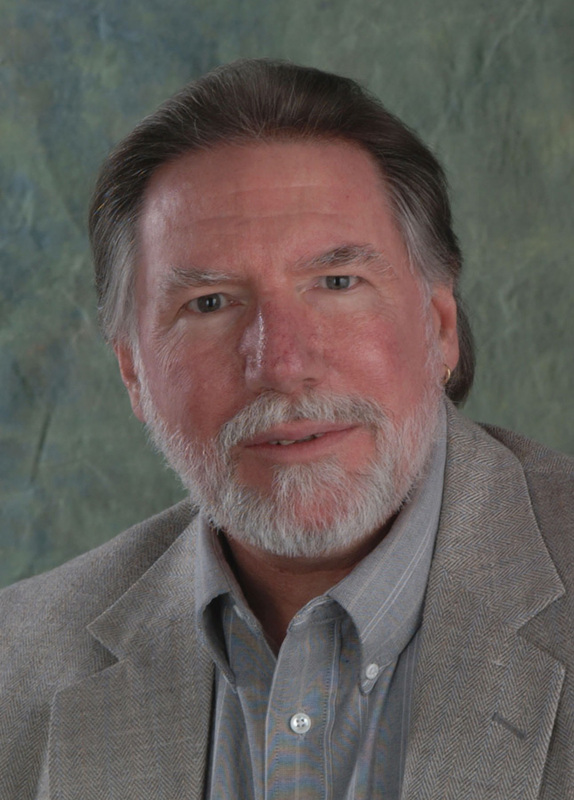 Steve Bohlert’s PR image [JPEG, 250 KB]. noun — A person advocating loyalty to and concern for others without regard to national or other allegiances. adjective — Universal in scope or character. noun — The pluralistic perspective of the essence seeker who finds truth in all authentic spiritual paths, seeing them as manifestations of the perennial philosophy. It is a stance that is open to truth in all its varied forms. It does not claim to be the only way. Rather, it seeks to find common ground with divergent spiritual communities. Available now, from Amazon.com, other international sources found at Sky River Press, and bookstores everywhere. As a pastor, I was impressed with Marcus Borg’s book, Meeting Jesus Again for the First Time, in which he re-imagined what Jesus may have been like. More recently, I read his The God We Never Knew: Beyond Dogmatic Religion to a More Authentic Contemporary Faith, in which he takes on the even bigger task of re-visioning God and the Christian faith based on this “new” vision of God. This is the sort of scholarship I admire in the Christian tradition—the ability to bring out alternative voices and interpretations from scripture and tradition. Borg and others like Matthew Fox, Dominic Crossan, and John Spong present new, exciting ways of thinking about faith rooted in the mystical wisdom tradition, which remains relevant today. While these leaders are not universally accepted, they are respected by persons seeking a more progressive Christian vision, and a large segment of the church is clearly moving in that direction. We live in a relativistic, pluralistic world open to truth in all forms. Our unique opportunity at this time allows us to take the best teachings and practices of all paths and integrate them into a multifaceted whole, which gives a more complete picture of Truth than any one path alone could. hat connects western luminaries and distinguished scholars such as Joseph Campbell, Paul Tillich, Marcus Borg, and India’s Bhaktivinode Thakur? They all represent a unique voice in the interpretation of the reality of faith, myth and religion. Marcus Borg, internationally known in both academic and church circles as a biblical and Jesus scholar, dedicated his life to what we may call re-thinking the big questions: God, the Bible, Jesus and Christian life. Joseph Campbell, an American mythologist, writer and lecturer needs little introduction as well. He is best known for his work in comparative mythology and religion. Paul Tillich was a German-American theologian and one of the most significant Christian existentialist philosophers of the 20th century. Bhaktivinode Thakur was unique among Indian scholars in the Radha-Krishna devotional tradition. Unlike many others, he saw the revelation of truth as progressive and its cultural appearance secondary to its spiritual meaning. 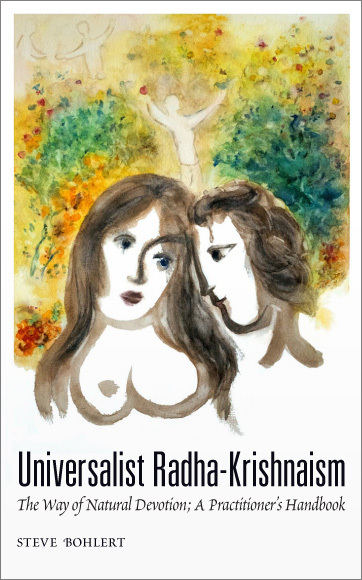 Steve Bohlert draws inspiration from their deep insights for his book Universalist Radha-Krishnaism, A Spirituality of Liberty, Truth, and Love and uniquely re-expresses the Indian-born idea of Radha-Krishna devotion and its myth for a post-modern, western context. This book comes as a cooling breeze on a hot day. It offers a glimpse into an eternal world of love that actually surrounds us at all times. The perfect world that Plato detected, just beyond the veil, really does exist, yet we spin our webs of karma so tightly that we cease to acknowledge it. As you read this book, you hear the music of the spheres, like the rising choral, Ode to Joy, in Beethoven’s final symphony. “Universalist Radha-Krishnaism is the first attempt to articulate a “progressive” or “modernist” form of Vaishnava Hinduism. 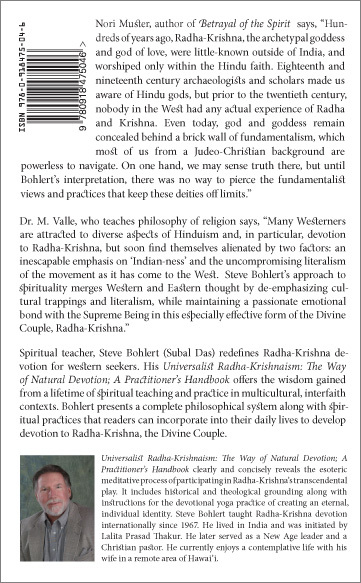 Drawing upon the resources of theological trends in Western scholarship, Steve Bohlert offers a synthesis of Eastern and Western thought that makes the heart of Radha-Krishna devotion fully accessible to Westerners who have no Indian background. Universalist Radha-Krishnaism is a spiritual journey and a modern synthesis like you have seldom seen before, and never in this unique context. It’s a bridge between the East and West, past and present, old and new. Continuing in the tradition of progressive, prolific western thinkers like John Shelby Spong, Marcus Borg, Joseph Campbell, Paul Tillich, and science visionaries like David Bohm, together with India’s own luminaries like Kedarnath Bhaktivinode Thakur, Steve Bohlert adds new acts in an ever unfolding play of human self-discovery and its relationship to the divine. […] Here we see the contextual nature of the religion. Chaitanya, his friends, and followers did not operate in a spiritual vacuum but as part of a changing society and culture. Society affected them, and they affected society. Although devotion is an individualistic affair, the individual still remains a part of society and should make a positive contribution to society. When a religion remains cut off from the rest of society, it becomes a cult. Universalist Radha-Krishnaism establishes a living, evolving process of God-dess realization rooted in traditional, Indian devotion, yet updated to preserve the essentials and discard unnecessary cultural practices, which alienate practitioners from contemporary society. We practice a natural style of devotion based on liberty, truth, and love. We combine the path of the heart, devotional love, with intellectual honesty and openness. Rather than basing our faith on a rigid set of beliefs, we open ourselves to God-dess’ leading by our total self-surrender. HERMENEUTICAL LEAP • […] Radha-Krishna stepped from the parochial stage of India, where for centuries they starred as the presiding deities of millions of persons, onto the world stage where they are not as well known. A theology that speaks the same language that the new, wider audience understands portrays Radha-Krishna as the living, active, universal God-dess. Bhaktivinode [Thakur] saw the cultural externals of the Radha-Krishna faith tradition as secondary to its spiritual essence. We preserve the spiritual essence of Radha-Krishnaism without many of the cultural trappings with which it was born. Radha-Krishna provide harmony and intensity of experience leading to transcendental enjoyment, so far unmatched in other theological systems. The major premise is that this life forms a prelude to eternal life. We need not sacrifice enjoying this life to enjoy the next life. Recognize the source of all enjoyment and avoid that which reduces enjoyment. ON LITERALISM AND MYTHS • […] Traditional Chaitanyaism takes a literal view of scripture. They believe the Vedic scriptures are more ancient than they are. According to legend, Vyas, an incarnation of God-dess, wrote them, and they contain the actual, words and deeds of God-dess and demigods from the beginning of creation or before. […] Often, devotees deny the reliability of the scholarly dates and instead accept a literal, pre-rational, magical-mythical worldview populated by God-dess, gods, goddesses, sages, and demons engaged in cosmic battles of good versus evil. They believe gurus perfectly preserved and transmitted this knowledge unchanged through the ages and that it contains literal information of life in the spiritual world, beyond the material creation of innumerable universes. ON “TEACHER” VERSUS “GURU” • Guru is a word often heavily laden with the baggage of unrealistic expectations and views which no one can live up to. On the other hand, a teacher is a person we can relate to in a give and take manner as a spiritual guide. It is like the difference between Protestant and Catholic views of clergy. A teacher is a person called, trained, and empowered to provide spiritual leadership connecting persons to their own direct relationship with God-dess. Good teachers do not allow themselves to be put on a pedestal. They are generally more humble and grounded, as well as less authoritarian than gurus. Teacher inspires student and student inspires teacher. It is a teacher-student rather than master-disciple relationship. ON SYMBOLISM • […] One important point for Bhaktivinode was that these symbols were not based on material conceptions, but on what we may call descending symbolism, or our grasp of spiritual archetypes as described by Plato, Carl Jung, and Joseph Campbell. This world emanates from the spiritual world. Therefore, patterns seen here are derived from there, not vice versa. Rather than project our patterns onto the spiritual world, this world acts like a distorted reflection of the spiritual world. Natural devotion is a conscious and loving effort to ascend through the symbolism toward our idealized existence—a reality where we can freely experience our full potential. Our natural call of the heart gets cut short if we get sidetracked into forests of lower symbols, such as religious rules and regulations. ON FAITH AND BELIEF • […] In Dynamics of Faith, Paul Tillich describes faith as “ultimate concern” and a centered act that involves the whole person. He also says what faith is not. It is not believing the unbelievable. Our beliefs may change over our lifetime, yet our faith remains solid. What do we have faith in? Do we have faith in God-dess, Radha-Krishna? The teachings of a guru? What some old books say? The process of devotion? The grace of God-dess? We need not believe anything to have faith, yet beliefs form the content of faith. We express those beliefs in symbol and myth. We may change and alter them over time just as we replace or rearrange the furniture of our home. The symbols and myths point to God-dess, but are not God-dess per se. Yet, they partake in the nature of God-dess and are simultaneously one and different from God-dess. ON SCIENCE • […] We accept a contemporary, scientific view of the world. The big bang theories, evolution, and quantum physics are acceptable in our world view. The holographic paradigm developed by physicist David Bohm and neurophysiologist Karl Pribram suggests this world exists as a multidimensional holographic projection of the spiritual world. […] In this postmodern age of cosmology, evolution, and the human genome, I see a richly satisfying harmony between scientific and spiritual worldviews. According to process theology, the whole cosmos, our knowledge of God-dess, and even God-dess evolve. ON OLD IDEAS THROUGH CONTEMPORARY LANGUAGE • […] In Chaitanyaism, the relation between the living entities and Cosmic Consciousness is described as simultaneous oneness and difference. It is one because Cosmic Consciousness exists as the source and ground of existence of the living entities from which they derive their nature as existence, consciousness, and bliss. It is different because the living entities share the nature of Cosmic Consciousness in relatively small measure. Their existence, consciousness, and bliss remain limited, while Cosmic Consciousness’ existence, consciousness, and bliss remain unlimited. Again, the analogy of a tiny part of a hologram or a fractal containing the whole is apt. God-dess, the heavens, hells, spiritual abodes and all creation exist within us as well as outside.